It‘s not a news scoop. 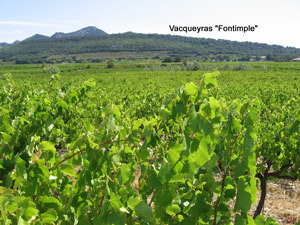 The spring was dry and hot and many French vine growers and farmers suffered from this dryness. Since June 2011, water restrictions have been imposed in over 50 departments. How to explain then that our region, which was also affected, (we measured rainfall of twice as low as in 2010 and higher temperatures), and that our vines were not affected by this drought stress. Normally, reduced rainfall and increased seasonal temperatures provoked a yellowing of the leaves. However, on our domain, we noted that our vine leaves kept their green colour; a sign of good health and adequate water supply. We think that our Bio Dynamic work for the last 16 years allowed the roots to descend to depths which allowed them to find the necessary water. A rainfall approximately twice as low as for the same period in 2010.. This dry summer weather was beneficial for us, because it allowed the flowering to evolve in the best possible conditions. In fact, when the weather is rainy and too cold at this time of the vine cycle, the fruiting does not happen correctly. It can lead to flower abortion on the grape clusters, which in turn means that the grape seeds do not take form. The fact that we had heavy rainfall during the ascension weekend (100mm in 3 days) even though the flowering was largely finished, was also a particularly positive event. These three days of rain and coolness, allowed the vines to bloom and the grape seeds to develop. Luckily, the hail showers only affected us slightly. At present, the grapes are wonderful; well aerated, the grape seeds are big and healthy. A great life force can be felt in all of these grapes. The fine summer weather is now well established. The weather conditions of the first trimester of 2011 were very good for us. A year after the tumultuous description of Mr Endre Gaarder Holien in our newsletter of July 2010, Mme Nathalie Gautherot, French wine professional, gives us her view on our Montirius Vacqueyras White ‘Minéral’, following one of our workshops ‘sentir et ressentir un vin’. ‘Indeed I was ‘challenged’ by your whites, perhaps because I had the impression of having been brought back to my birthplace in the region of Chablis. These wines said something to me which allowed me to ‘free’ my ghostly energies that blocked me at the beginning of the evening. I want to share the pleasure of my comments and feelings that this meeting with your Montirius Vacqueyras White ‘Minéral’ brought. It was tasted in the prime of it’s youth and its evolution and disturbingly surprising mineralogy is the vertebral column of each of the vintages tasted’. Minéral 2009 : The colour is pale yellow, with brilliant silver tinges, a sign of its youthful prime. The first slight brush with the nose is fine and delicate, notes of citrus fruits and then white flowers (acacia, lime tree) progressively taking their place. The attack in the mouth confirms the hints of citrus with a sensation of freshness sustained by a lovely smooth roundness. In the middle of the tasting, we perceive the depth of the mineralogy. At the end of the tasting, this wine has length which finishes with a slight touch of honey. If I may be permitted to draw a Burgundy parallel, I’d say that it reminds me of a ‘Petit Chablis’ from the domain of Marc Brocard, a bio dynamic wine grower for quite some time, whose motto is ‘ Where wine takes life, my domain takes roots. The land is a gift’. Another plus for JM Bocard, he never uses oak barrels for his wines….. yet another plus for your wines which have a superb ageing potential’. Minéral 2006 : The colour is more sustained that of the 2009, a sign of its development (knowing that as Eric pointed out it is the Roussane which gives this ‘gold’ aspect). The nose is intense, marked by hints of – not fruitiness, but actual ground stone; SILEX! (just like after a storm). Then, if you close your eyes and detach yourself from your mental process (as Eric suggests) we are taken to the heart of Chablis. In the mouth the sensation is ethereal (again, this lovely freshness characteristic of your wines), and lengthy. The final taste combines freshness and a crystal clear sensation – a lovely harmony. Minéral 2005 : The colour is a lovely solid yellow, almost straw coloured. At first the aromatic nose invites us into a fiery third world, allowing hints of dry fruits, walnuts and also preserved fruits such as quince. A little like the golden Jura wines (the oxidized aspect of these noble wines). In the mouth it is full and expressive; a trio comprising spices, minerals and vegetables. It is fine, elegant and rounded. The final taste is superb and this ‘touch of ‘mintiness’ lasts at the right moment, giving a desire to taste again (which is what Eric, Michel Blanc and I did at the end of the evening! ), to repeatedly appreciate this balanced powerful and aromatic wine. And so my voyage to the heart of your ‘Minéral’ vintages ends. Of great purity and style, we should give them our confidence and linger with them in patience and perception, just as your motto says: ‘Listen to the vines, to the grapes and the wine ‘authentic and alive’. It was therefore during the wine tasting observations of our whites that we became aware that we have great white wines here at the winery. One of the best means of ageing is in Magnums. 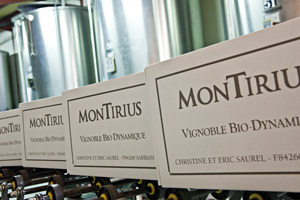 The 2010 Montirius white ‘Minéral’ is in bottles of 750 mls, and Magnums – A first! Continuing with our 2010 Montirius white ‘Minéral’, for the first time we harvested the 3 grape varieties, White Grenache, Roussane and Bourboulenc at the same time. The wine was vinified with the three varieties together. As always in the past, the ‘White Grenache’ and the ‘Roussane’ are varieties which ripen early and are harvested before the red grapes. They are vinified together. The ‘Bourloulenc’ is a late variety. It is at full maturity 3 weeks after the end of the harvest of red grapes. It was therefore, until now, vinified separately. However, in 2010, the 3 varieties ripened at the same time. We can explain this by the fact that for the first time with the ‘Bourboulenc’ vine which has very lively leaves, we succeeded in not pollarding them; we bound the vine shoots around the wire trellising and conserved the apex. We are very pleased with the opportunity the grapes gave us, because the alchemy of this co-fermentation during the alcoholic fermentation stage, allows a new balance and more harmony to appear in this wine. We hope to repeat this experience in 2011. The vines give of their best in the grape maturity, we remain at their service and will adapt accordingly. 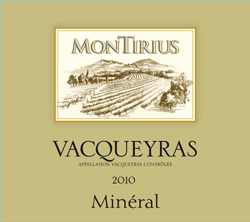 Our Vacqueyras white Montirius ‘Minéral’ 2010 was bottled at the beginning of spring. Effectively, it is not necessary to leave it too long in the vats, because white wine fears oxidation. We wish to conserve all its aromas of white flowers, honey and freshness. It is important to change its containers rapidly and continue its maturity for many months even years in dark bottles which protect it from the light. With regard to our red Montirius Gigondas Confidentiel 2010, Cotes du Rhône ‘Sérine, and Vacqueyras Garrigues, we are in the process of bottling them at the moment. We judged, after successive tasting, (approximately at 6 week intervals, the next one will be the 13th July 2011) that they were ready for bottling. It is not however the case for our red Gigondas ‘Terre des Aînés’ and the ‘Clos’ de Vacqueyras, which still need to mature in vats. Given that we will not rush them, we will give them all the time they need. Bottling a wine does not imply that we commercialise it immediately. We leave our wines to rest in their bottles at least 3 months before their sale, which is then decided by their complexity and need for maturing. The more the wine is structured and has complex, fleshy, strong tannins, the longer the maturing process either in vats or bottles. We will proceed with the commercialisation of our red Montirius Vacqueyras ‘Garrigues’ 2010 towards the end of September 2011 (to be confirmed after another tasting in 2 months). Likewise for our red Montirius Cotes du Rhône ‘Sérine’ 2010 which will continue to mature in bottles until Christmas 2011, as well our red Montirius Gigondas ‘Confidential’ which will rest and mature bottled in our winery for at least 18 months. Even when we start to commercialise these new wines, they will still have a maturing potential of 10-15 years for some of them, either in our winery or in your wine cellar. If you wish, it would be with great pleasure that we could guide you to choose the right time to drink a given vintage or reserve, while harmonising its optimal potential to your tastes, palate and search to harmonise with the right foods. It is an experience we would love to share with you. Once again we are at the time when we talk of the indicator to forecast the start of the harvest: the cicada. The indicator is the date on which it sings for the first time in the parcel called the ‘Le Clos’ at the beginning of the plateau of Vacqueyras vines. In 2011, the cicada sang for the first time on the 14th June, about 10 days earlier than in 2010. Perhaps heralding a start of the harvest on the 1st September. In any event, we will keep you informed of the possibility of an early start by asking our team of winery and vine workers to return from holidays earlier than usual – around the 25th August 2011. Our team which we are currently putting together, will be ready to start cutting the grapes around the 29th August…… to be continued. Our Montirius red Vacqueyras ‘Le Clos’ 2007 is the official wine for the 65th Avignon Festival. For the fourth time, one of our Montirius vintages has been chosen by the Avignon Festival (6th July to 26th July) to represent the Vacqueyras classification of wines. The official presentation to the press was done at the prestidigeous restaurant ‘Christian Etienne’ in the company of Eric and Christine Saurel. This special reserve will be stamped ‘Official cru of the Avignon Festival’ and will accompany the highlights of the festival. Its sale will be exclusively at the festival boutique situated on the ‘Place de l’Horloge’ in Avignon. 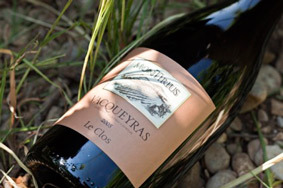 Taste our red Montirius Vacqueyras ‘Le Clos’ 2007. On the 15th July 2011 at the ‘Maison des Vins’ from 19.00 hrs to 21.00 hrs, the festival participants, the press and the festival partners will be invited to discover the 3 official wines of the 2011 festival. Come and join us! You can taste our red Montirius Vacqueyras ‘Le Clos’ 2007 the official red wine of the 2011 Avignon Festival. Our other Montirius wines join the Festival! In the context of the partnership between Inter Rhône and the festival, the Cotes du Rhône wines will also be present during all the receptions given by the Avignon Festival. Our red Montririus Vacqueyras 'Le Clos' 2007 chosen at the Epicuriales de Bordeaux ! Christine and Eric went to Bordeaux for Vinexpo, the International professional fair. On the evening of Monday the 20th June, the ‘épicuriales’ were had, as every year for the last 2 years, between the 16th June and the 3rd July. ‘Biodyvin’ the international syndicate of bio-dynamic wine growers, offered the wines proposed for the evening. Also participating at this event were, 16 michelin star chefs of whom 4 have two stars, 11 one star and the finalist of the TV show ‘Top Chef’ Pierre Sang. Our red Vacqueyras Montirius ‘Le Clos’ 2007 was chosen to be associated with the menu of Benjamin Toursel, chef of l’Auberge de Prieuré’ at Moirax. The harmony of food and wine was done with a main course of ‘M. Linan’s pigeon, smoked celery, chocolate and green apples’.! Montirius ‘Sérine’ 2009: an almost perfect wine! The first event of ‘Un vin presque parfait’ ‘An almost perfect wine’ was held a the Palais Brongniart in Paris on the 9th June last. Our red Montirius Cotes du Rhône ‘Sérine’ 2009 got its diploma having been tasted by a jury of both professionals and amateurs who tried 1.200 bottles of which 408 were selected this year. ‘A selection for an by the public’ The event will continue in the book shops from mid October 2011 during the publication of the official guide ‘An almost perfect wine’. It is co-edited by M6 publishing and Hachette Pratique and will cite all of the awarded wines. Both the professional and the general press were enthusiastic about our wines this winter and spring. Other articles to be found on our web site. 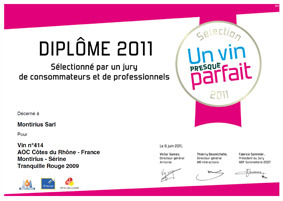 Our wines got numerous medals since the start of 2011. Gold Medal given to red Montirius ‘Confidential’ 20099.
attribue une note de 17/20 à notre Montirius Vacqueyras Le Clos 2009. Read the article. 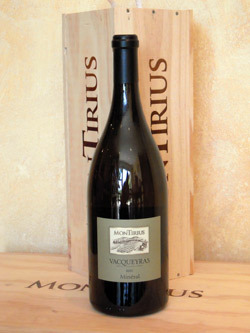 Red Montirius Vin de Pays de Vaucluse ‘Le Cadet’ 2010 got the gold medal ‘Elu Plaisir’ 2011 (1st edition). See the page ‘Awards’ on our web site. Regular updating. Discover a presentation of our domain on our web site under ‘instants choisis’ (chosen moments). Our discovery and educational workshops. 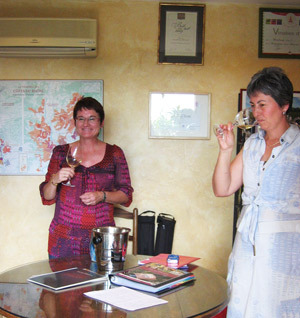 Run by Christine Saurel, these workshops are held with one’s ‘ feet in the vines’, in front of a panaromic view of the Mt Ventoux, the Dentells de Montmirail, the foothills of Chatêauneuf du Pape, the Luberon and the Alpilles. You will discover the different aromas of each soil type and the varied vine classifications through a wine tasting. Throughout the workshop you will have concrete explanations of how we work in the Bio-Dynamic culture. The workshops are held each week day from Monday to Friday, by appointment only. Limited number of places. Price per person: 25 euros. You are welcome to come for a wine tasting all throughout the summer without an appointment from Monday to Friday 9.00 a.m. to 12.00 and 14.00 to 18.00.